My friend (and former high school student) who is one of the awesome mamas on my son’s soccer team is part of OK Farms here in Hilo. I have been following the Instagram account for OK Farms and have been enjoying their awesome photos of Hawaii, its products, its residents, and its visitors. I asked my friend Ala a few questions about OK Farms and here are her answers and some of her beautiful photos. What is OK Farms? What is the history behind OK Farms? How did it get started? OK Farms, established in 2002, is a tree crop farm nestled alongside the banks of the Wailuku river. The name OK Farms represents Ed Olson and Troy Keolanui. The property that OK Farms is on used to belong to the C. Brewer Sugar Plantation and was once a sugar cane farm! Mr. Olson was very interested in purchasing property and to keep it as once was – meaning agriculture…farming. I see pictures of people visiting OK Farms on my IG feed. Can anyone visit the farm? What would a visit to the farm be like? Meet and Greet at farm warehouse. Drive to the orchards while hearing about the history of this land. Walk through our macadamia nut orchard, view two waterfalls, coffee orchard, and Spice Road. Return to the warehouse for macadamia nut cracking and sampling. We even have a gift shop where you can find local products for purchase. We have contracted tours that come to the farm daily. We even have a landing spot near one of our waterfalls for helicopters to drop off their guests. If you are interested in setting up a tour, please send a message to tours@okfarmshawaii.com. What makes OK Farms special and unique? We are a hidden gem in Hilo. As you drive up to our farm you’ll feel relaxed as you enjoy the country scenery and escape from your life’s daily obligations for just a little while. Who are the people behind OK Farms? Ed Olson and Troy Keolanui are the two people behind the dream of this farm. We also have many wonderful and dedicated employees. What would I see at OK Farms? Can I buy produce directly from the farm? You will see an abundance of macadamia nut, citrus, tropical fruit, hearts of palm, cacao, and spice (cloves, curry leaves, all spice, cinnamon and nutmeg) trees. Yes, we do sell our produce here at the farm as well. Why is there a soccer field at OK Farms? We are a BIG soccer family. We get about 142 inches of rain per year and when it rains our fields on Bay Front always gets flooded. Troy had the perfect space to create a soccer field, and so he did. This field is for the community. This is Hilo High School soccer team’s home field. 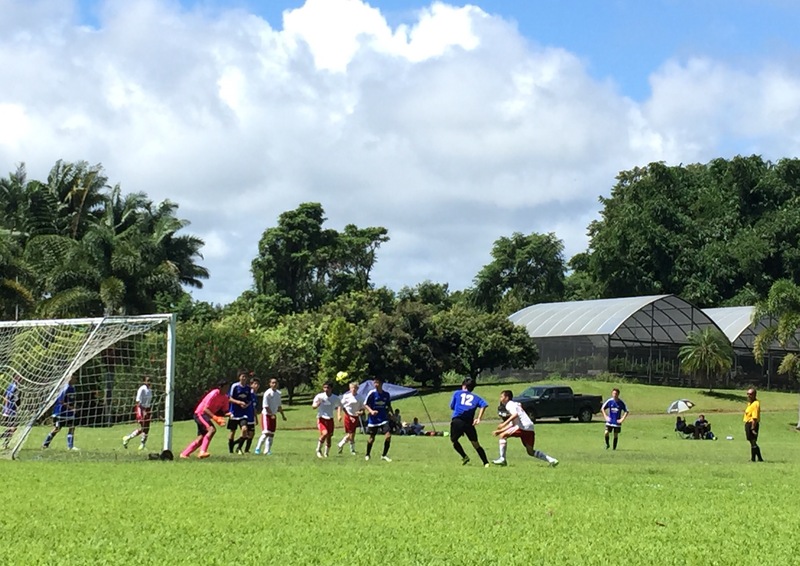 Also AYSO, HYSA and the University of Hawaii at Hilo have their matches up here at OK Farms too! On the weekends it’s usually packed with soccer lovers. When there isn’t a soccer game going on, helicopters also use the soccer field as a landing spot to drop off farm visitors. You know what I love about OK Farms? How much they give back to the community! Not only do they basically invite us into their home to play soccer, but they donate generously to fundraisers, silent auctions and nonprofits. I really appreciate them doing good for Hilo and the land. Mahalo Olson and Keolanui families!! Thank you for sharing this…I really want to take a tour … it looks very serene!